Home / Unlabelled / Nokia building 41-megapixel phone with Windows 8? 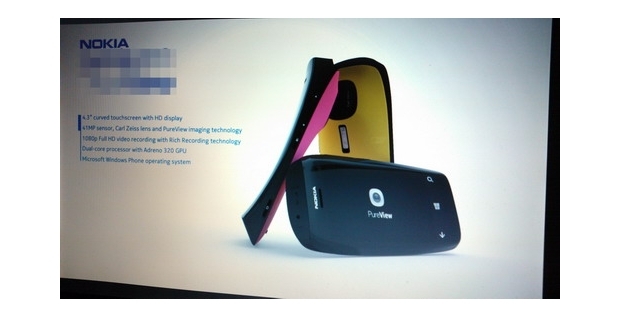 Nokia building 41-megapixel phone with Windows 8? Nokia could be cooking up another 41-megapixel phone, this time running on Windows 8, if leaked slides supposedly snapped at a Nokia presentation are to be believed. Spotted by Androsym, the images -- originally posted at 168.com -- show a blocky-looking mobile bearing the PureView camera-tech logo, as well as specs that peg the device as owning a curved 4.3-inch HD screen. A dual-core processor is also mentioned, and if you take a peek at the touch-sensitive buttons you can see the one in the middle is bearing the recently revealed Windows 8 logo. This could well be a concept design rather than a finalised product, but assuming the slides are genuine, it does tell us what we already suspected -- that Nokia is planning on bringing its insane camera technology to Windows Phone-powered devices. PureView is the label Nokia's applying to its frighteningly high-resolution camera gubbins, first spotted in the Nokia 808 PureView. That phone is running Symbian though, which is leagues behind the likes of iOS or Android in the operating system stakes. My esteemed colleague Rich Trenholm noted when he went hands-on with the 808 that it it felt "like an experiment". With Nokia putting so much emphasis on its Lumia 800 and Lumia 900 mobiles, it's looking like our favourite Finns' future lies with Microsoft. I think that's good news though. The reason so many people were excited about last year's Lumia 800 was because it married Microsoft's extremely slick OS with Nokia's hardware chops. The Lumia 800's camera was actually a bit disappointing, so fingers crossed the whopping PureView tech can spice up Nokia's next effort.